The SS Palo Alto, aka The Cement Boat, took a major hit from our recent storms. The front third of the ship broke off and settled on its side. The back end lost a bit of integrity as well. After reading the news, it was clear that a photo safari to document the incident was in order. We had hoped to get some good close-up shots from the end of the pier, but unfortunately it was closed--probably a good idea considering the damage incurred. 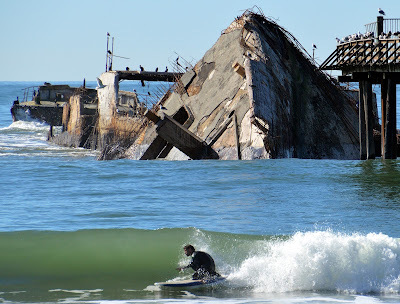 Officials say the wave-ravaged ship will be treated with benign neglect. Hopefully the pier itself will reopen and offer a better, close-up view of the listing bow piece. Successful safari. That thing really did take a beating. Wonder if it was a s-l-o-w event or if there was a loud, satisfying CRACK and over it toppled? My favorite pic? The "A surf board, a bird, and a boat" shot. By the way, the creepiness factor for that ship at least doubled now.